1 Heat olive oil in large deep nonstick skillet over medium-high heat and cook onion and zucchini, stirring occasionally, 4 minutes. Add garlic and cook 30 seconds. Stir in tomatoes, wine and Knorr® Vegetarian Vegetable Bouillon Cubes and simmer 2 minutes. 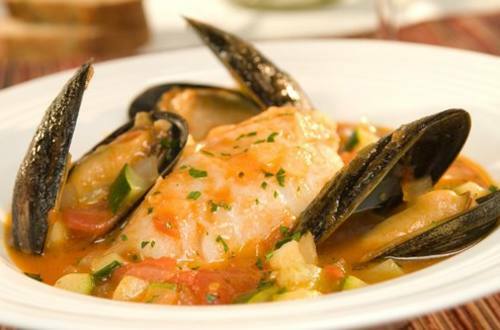 Arrange cod and mussels in skillet. Simmer covered 8 minutes or until fish flakes with a fork and mussels shells open. Discard any unopened shells. Sprinkle with parsley and serve with warm crusty bread.